You can teach seven languages free at iclanguage.com: French, Spanish, Latin American Spanish, German, Italian, English ESL and Welsh. For each language there are both 50+ primary / elementary and 50+ secondary / intermediate topics available. Each of our teaching products offers three excellent and innovative teaching activities. Each product also offers 10 whole class games that you can use to reinforce the language you introduced with the teaching activities. 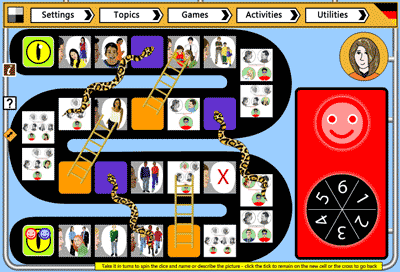 The games offer a choice of number of teams, number of topic pictures to use, etc. 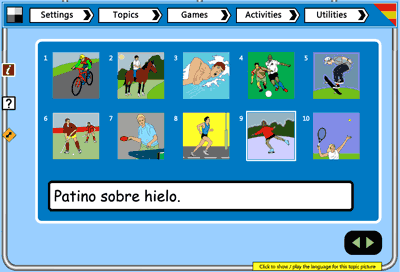 There is also a "View all" utility for viewing topics in preparation for your language lessons. If you are a pupil and want to learn a language, go to Learn languages online. Our teaching products offer activities, whole class games and two administrative utilities. They are suitable for both primary/elementary and secondary teaching of 5 languages. Selecting Primary/Elementary gives you access to our 10 picture topics. Selecting Secondary gives you acces to our 20 picture topics. Every picture in every topic comes with a default text and corresponding audio. The core teaching topics are identical to those (also free) of our learning resources. 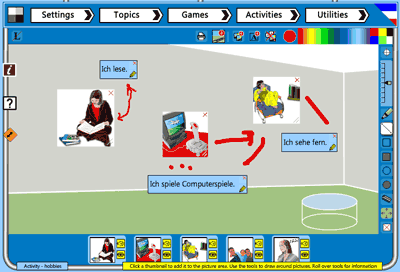 Our teaching resources are built with Flash - they will not play on tablets or mobiles.